Michael Finkel has an interesting past as a journalist. Once a reporter for the New York Times (he was fired after it was revealed that he created a composite subject out of many sources), his first book, True Story: Murder, Memoir, Mea Culpa, told the story of a fugitive who used the name "Michael Finkel" as an alias while on the run from police--a true (if stranger than fiction) story. 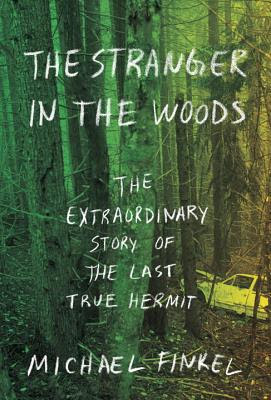 His newest book, The Stranger in the Woods: The Extraordinary Story of the Last True Hermit, is once again a true tale that feels stranger than fiction, detailing the solitary life of Christopher Knight, who lived (voluntarily) as a hermit in the Maine woods for 27 years. The Stranger in the Woods is exactly the type of non-fiction I like best, combining a study of life and lifestyle choices with reflections on the outdoors, rolled into enough contextual detail to give it all meaning without venturing over 250 pages. * Knight's story alone is fascinating: his impromptu decision to leave his family (indeed, his entire life) behind at the age of 21, his difficulties establishing a home for himself in the woods and his ingenious contraptions built to support his solitary lifestyle, and his morally questionable decision to steal from nearby camps and cabins to survive makes for interesting reading on its own. Finkel fleshes out Knight's tale with additional contextual detail, though, which is where The Stranger in the Woods becomes most compelling. By providing the history of hermits around the world, exploring the tensions between modern life (and contemporary law) and Knight's decisions, and the moral grey area in which Knight lived both as a hermit and after his eventual capture, Finkel gives Knight's life a relevance beyond the borders of his small campsite tucked into the woods around North Pond in Maine. Interviews with Knight, law enforcement personnel, and locals whose lives were impacted by Knight's thefts over the years add both anecdote and personal flavor to the tale. Most of this context is excellently done, offering just enough information to make Knight's story relevant without venturing into filler territory, though the additional information provided around Knight's three possible diagnoses (Asperger's, depression, or possible schizoid personality disorder) felt sloppy at best, offensive at worst (offering Virginia Woolf's suicide as proof of her later Asperger's diagnosis; failing to consider if symptoms chalked up to Autism might have been the result of solitude instead of a disease that caused it). These blunders aside, The Stranger in the Woods is surprisingly successful at placing Knight in the context of his decisions, aiming to understand (perhaps not entirely successfully) why Knight chose to live alone, and how he managed to do so for so long. "Modern life seems set up so that we can avoid loneliness at all costs," muses Finkel, "but maybe it's worthwhile to face it occasionally." Reading Knight's story is one step towards facing that loneliness, imagining 27 years of solitude that seems extreme, perhaps, but also somehow understandable. *This is not to suggest that I won't read non-fiction over 250 pages, but rather a result of having read one too many 300+ page book on some fascinating concept that really should have been a long-form essay or magazine article. Not everything has enough filler to reach full book-length, and that's ok.